Identified at the beginning of the 20th century, citrulline is a non-proteinogenic amino acid, the natural form of which is L-citrulline. This natural amino acid was first discovered in watermelon (Citrillus lanatus), hence its name. Although it was originally found in plants, citrulline is also present in humans and other mammals which is why a number of scientists have been investigating its effects in the human body. Their research has led to the identification of an important function of citrulline: it acts as natural endogenous precursor of arginine, one of the 20 amino acids classified as essential for human health. In fact, arginine plays a role in several of the body’s vital functions. In particular, it is involved in the urea cycle, enabling the urea production necessary for regulating levels of nitrogen compounds in the body. In addition, citrulline stimulates nitric oxide production, a substance which promotes vasodilation – the dilation of blood vessels. This is why citrulline benefits are of increasing interest to sportspeople. While citrulline is sometimes used therapeutically to correct deficiencies or to address problems with the urea cycle, it is becoming increasingly popular with sportspeople. This is because of its role as a natural precursor of arginine, an amino acid known to support muscle growth and post-exercise recovery. Studies on citrulline also suggest it maintains muscle mass in the face of cellular ageing, a major advantage for those who engage in strength training. Other studies have revealed that citrulline may help improve physical performance, a benefit linked to reductions in muscle fatigue and improved recovery following intense physical activity. This explains its growing popularity with amateur and professional sportspeople. Citrulline as an alternative to arginine supplementation? Given the many articles that have been published on citrulline, a lot of sportspeople are wondering about the differences between citrulline and arginine. While arginine offers undeniable benefits for health and physical performance, some people question how much is actually obtained from taking dietary supplements. Criticism of arginine supplementation usually relates to the efficacy of dietary supplements and the risk of unwelcome side-effects such as gastrointestinal problems and diarrhoea. 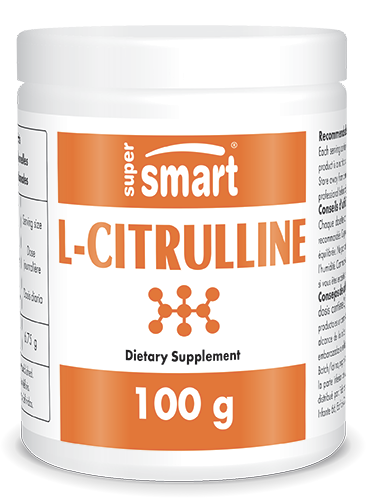 Since l-citrulline supplements are well-tolerated by the body, they appear to represent an excellent alternative to arginine supplementation. Having said that, advances in formulation have meant new forms of arginine such as Arginine Silicate Inositol and Arginine Alpha Ketoglutarate are now available. These two specific forms of arginine, both of which can be purchased from our online catalogue, are easily absorbed and well-tolerated by the body. So today, there are some people who are fans of arginine, while others prefer the benefits of l-citrulline. Our new dietary supplement L-Citrulline has been specially formulated to provide an optimal dose of citrulline, delivered in convenient, easy-to-use scoops. For optimal efficacy, three scoops a day is recommended, split into two doses. This citrulline dosage can, however, be adjusted in line with your needs and the advice of your therapist. To increase nitric oxide synthesis, other arginine supplements are available such as the complexes Acetyl L-Carnitine Arginate and Arginine Silicate Inositol, and the specific form Arginine Alpha Ketoglutarate.